Have you ever tried listening to it? It seems like every few days there's a new list that claims to compile the best something-or-others of all time. However, there are times in life where you just have to be cruel to be kind. Even musical geniuses are capable of taking their eye off the ball, and how often have you given a supposed classic record a spin and wondered exactly what other people can hear that you can't? Now, don't get me wrong. I love The Beatles. But I noticed recently that I hardly ever delve any deeper into Pepper than giving A Day In The Life an occasional airing on my iPod. Given that I listen to Help!, Rubber Soul, Revolver and The White Album on a regular basis, this struck me as odd. Isn't Pepper supposed to be the most important album of all time? Yes, the production still amazes, and yes, there are a few stone cold classic songs on it. Hell, even the artwork is brilliant. But as a cohesive album, I just don't see how it hangs together in the way that Revolver or Rubber Soul does. It's just too confused a collection of disparate ideas and sonic sketches, with a 'concept' that even the band themselves got bored with two songs in. Twenty years after The Beatles established the double-album as a forum for artists to expand and exhaust their musical impulses, Sonic Youth rammed it into a brick wall of redundancy and tedium. Listen, I'm down with experimental: Glenn Branca, Laurie Anderson, Brian Eno - I get it. But art rock should provoke wondrous thought as it stirs emotions, and unfortunately, the constant thought bubble over my head while I listen to tracks such as Teenage Riot and Providence is, "Tune your guitars already! ", and the only emotions I feel are anger and boredom. With the back-to-back smashes Clouds and Ladies Of The Canyon, Joni Mitchell established herself as major force in pop music. Songs like Big Yellow Taxi and Woodstock combined wistful, lighter-than-air melodies with lyrics that held a mirror up to society. On 1971's Blue, Mitchell began to stare increasingly at her own reflection - the results make me wish she got out of the house more. Raw, confessional songwriting can be spine-tingling - John Lennon's Plastic Ono Band album is a towering testament. But whereas Lennon showcased his therapy-borne insights with sturdy riffs and unshakable melodies, Mitchell, on meandering compositions like My Old Man and California, is all over the place and nowhere. She has much to say but she spends too much time...not getting around to it. Her singing style, too, gets in the way; it isn't quite a melissma, but it's dangerously close - it's like a buckshot approach, one that leaves many holes but doesn't hit the target. Lost in a wash of mediocrity, Ten is the poorest part of the grunge odyssey. The main reason for this is that Pearl Jam are really just a middle American bland rock band who are barely more credible than Hootie and The Blowfish. As spicy as a natural yogurt, even the most potent cuts like Alive and Jeremy are basically the same song: single note riff, tales of 'real-world' woes that would make even Jon Bon Jovi wince. They are so 'grunge' that when guitarist Mike McCready was asked what his thinking was behind the solo to Alive, he answered that he was trying to copy KISS guitarist Ace Frehley! KISS for heaven's sake! First of all, let me just clarify two things: 1) I don't dislike Captain Beefheart - Shiny Beast (Bat Chain Puller) is an enjoyable album. And 2) I appreciate experimental music - I like John Cale and Philip Glass, see? 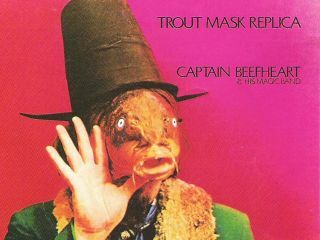 But, for me, Trout Mask Replica is beyond comprehension. My disdain for this record grows every time it graces a list in the music press. Most recently was Rolling Stone's 500 greatest albums of all time - there it is, that stupid trout-faced cover staring at me from the page, at number 56! Is it really better than Meet The Beatles (number 59) or Purple Rain (number 72)? No chance. When Oasis's second album was released in 1995, reaction from certain sections of the critical press was lukewarm at best. Attitudes changed when (What's The Story) Morning Glory? went on to sell about a gazillion copies, but the truth is that the dissenters were right all along. Wonderwall, the record's commercial highpoint, remains the dreariest of mid-tempo strum-a-longs, while Don't Look Back In Anger isn't the anthem it wants to be. And then there are the lyrics: She's Electric sounds like it was knocked off in five minutes by someone with an unhealthy amount of respect for a rhyming dictionary, and Champagne Supernova's "Slowly walking down the hall, faster than a cannonball" is a couplet that makes me recoil every time I hear it. Unavailable for years due to disagreements over copyright ownership, Pacific Ocean Blue has long been hailed as a lost classic, a work of extraordinary emotional depth from a former Beach Boy wrestling with alcohol problems. As a result of its scarcity, it's become an achingly cool album to namecheck, but even after a couple of listens it's clear that Pacific Ocean Blue is no Surfin' Safari, let alone Pet Sounds. Mired in mid-seventies saccharine and easily capable of causing even the most ardent keys fan to suffer a piano overdose, the arrangements hamstring much of the emotive potency of a record that ultimately sounds as lost as its tragic protagonist.